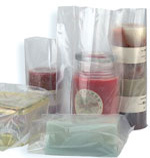 Gusset Poly Bags are clear Low Density Polyethylene with gusseted (expandable) sides or bottom. Gusseted Poly bags will give you ample space to fill when the bag is opened. Our large selection of gusseted bags is available in a variety of mil thicknesses to fit your specific needs. If you don’t see the size you need please call and ask about our manufacturing of custom sizes. 1. Measure the width, depth and height of the box to be lined. The depth will be the shorter side. 2. To determine the Width (W) of the bag needed, add 1" to the width of the box. 3. 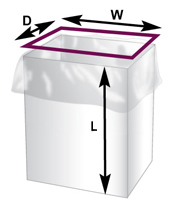 To determine the Depth (D) of the bag needed, add 1" to the depth of the box. 4. The Length of the bag is determined by adding the depth to the height of the box plus 6" to allow coverage of the box contents. Example: if the box size is 18" wide x 12" deep x 14" high, the bag dimensions are: Width (W) is 19", Depth (D) is 13", Length is 33"